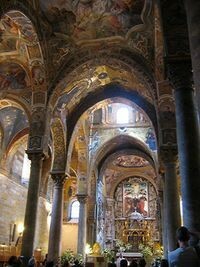 La Martorana, also known as Santa Maria dell'Ammiraglio (Saint Mary of the Admiral), is a church in Palermo (Sicily, Italy). The church is annexed to the next-door church of San Cataldo and overlooks the Piazza Bellini in central Palermo. The name Ammiraglio (admiral) derives from the founder of the church, the Greek admiral and principle minister of Roger II of Sicily, George of Antioch. The foundation charter of the church, in Greek and Arabic, is preserved and dates to 1143; construction may already have begun at this point. The church had certainly been completed by the death of George in 1151, and he and his wife were interred in the narthex. In 1184 the Arab traveller Ibn Jubayr visited the church, and later devoted a significant portion of his description of Palermo to its praise, describing it as "the most beautiful monument in the world." After the Sicilian Vespers of 1282 the island's nobility gathered in the church for a meeting that resulted in the Sicilian crown being offered to Peter III of Aragon. In 1193-94, a convent of Benedictine nuns was founded on adjacent property by Eloisa Martorana. In 1433-34, under the rule of King Alfonso of Aragon, this convent absorbed the church, which has since then been commonly known as La Martorana. The nuns extensively modified the church between the 16th century and the 18th century, making major changes to the structure and the interior decoration. The nuns of the Martorana were famous for their moulded marzipan, which they made in the form of various fruits. Although the convent no longer exists, frutta di Martorana are still one of Palermo's most famous and distinctive foodstuffs. In 1935 Benito Mussolini returned the church to the control of Palermo's Greek Orthodox community. It is still used today for Greek Orthodox services and shares cathedral status with the church of San Demetrio in Piana degli Albanesi. The original church was built in the form of a compact cross-in-square ("Greek cross plan"), a common south Italian and Sicilian variation on the standard middle Byzantine church type. The three apses in the east adjoin directly on the naos, instead of being separated by an additional bay, as was usual in contemporary Byzantine architecture in the Balkans and Asia Minor. In the first century of its existence the church was expanded in three distinct phases; first through the addition of a narthex to house the tombs of George of Antioch and his wife; next through the addition of a forehall; and finally through the construction of a centrally-aligned campanile at the west. The campanile, which is richly decorated with three orders of arches and lodges with mullioned windows, still serves as the main entrance to the church. Significant later additions to the church include the Baroque façade which today faces onto the piazza. In the late 19th century, historically-minded restorers attempted to retain the church to its original state, although many elements of the Baroque modifications remain. Certain elements of the original church, in particular its exterior decoration, show the influence of Islamic architecture on the culture of Norman Sicily. A frieze bearing a dedicatory inscription runs along the top of the exterior walls; although its text is in Greek, its architectural form references the Islamic architecture of north Africa. The recessed niches on the exterior walls are likewise derive from the Islamic architectural tradition. In the interior, a series of wooden beams at the base of the dome bear a painted inscription in Arabic; the text is derived from the Christian liturgy (the Epinikios Hymn and the Great Doxology). The church also boasted an elaborate pair of carved wooden doors, today installed in the south façade of the western extension, which relate strongly to the artistic traditions of Fatimid north Africa. On account of these "Arabic" elements, the Martorana has been compared with its Palerman contemporary, the Cappella Palatina, which exhibits a similar hybrid of Byzantine and Islamic forms. The church is renowned for its spectacular interior, which is dominated by a series of 12th century mosaics executed by Byzantine craftsmen. The mosaics show many iconographic and formal similarities to the roughly contemporary programs in the Cappella Palatina and in Cefalù Cathedral, although they were probably executed by a distinct atelier. The walls display two mosaics taken from the original Norman façade, depicting King Roger II, George of Antioch's lord, receiving the crown of Sicily from Jesus, and, on the northern side of the aisle, George himself, at the feet of the Virgin. The depiction of Roger was highly significant in terms of its iconography. In Western Christian tradition, kings were customarily crowned by the Pope or his representatives; however, Roger is shown in Byzantine dress being crowned by God himself. Roger was renowned for presenting himself as an emperor during his reign, being addressed as basileus ("emperor" in Greek). The mosaic of the crowning of Roger carries an inscription in a blend of Latin and Greek (Rogerios Rex, the former word in Greek, the latter in Latin). The nave dome is occupied by the traditional Greek image of Christ Pantokrator surrounded by the archangels St Michael, St Gabriel, St Raphael and St Uriel. The register below depicts the eight prophets of the Old Testament and, in the pendentives, the four evangelists of the New Testament. The nave vault depicts the Nativity and the Death of the Virgin. The newer part of the church is decorated with later frescoes of comparatively little artistic significance. The frescoes in the middle part of the walls are from the 18th century, attributed to Guglielmo Borremans.